During our long journey through history, the holy resting places of our righteous forebears have served as spiritual oases in times both joyous and sad. The "Cave of Machpela" - burial site of our Patriarchs and Matriarchs, Mother Rachel's Tomb in Bethlehem and King David's Tomb on Mt. Zion are among the best known. These places are referred to in the Bible and Talmud, in Halachic and esoteric works, as places for prayer, reflection and introspection, as well as being sources of strength and inspiration that have provided solace to millions throughout the generations. Our sages ask: “Why did Jacob bury Rachel on the way to Efrat, rather than carry her body to the ancestral plot in the cave of Machpela?” They explain that Jacob had a prophetic vision of the Jewish people passing Rachel’s burial place as they were exiled from Jerusalem and led to Babylon. Whereupon Rachel would intercede on there behalf and her prayers would be heard: “A voice is heard in Ramah, lamentation and bitter wailing, Rachel weeping for her children…. Thus says G‑d: ‘Withhold your voice from weeping and your eyes from tears. Your work will be rewarded…. There is hope for your future…., your children will return from the land of their enemies’.” (Jeremiah 31). The Talmud tells us that on his way with the spies to Israel, Caleb paused in Hebron at the graves of the Patriarchs and asked them to arouse heavenly mercy to save him from becoming embroiled in the spies’ unfortunate plot. The Shulchan Aruch (Code of Jewish Law) advocates visiting the graves of righteous men and women on the day prior to Rosh Hashanah to pray for a good new year “as the resting places of the righteous are holy and pure and prayers there are very potent”. The Rebbe, would frequent the gravesite of his father-in-law, the sixth Rebbe, Rabbi Joseph Isaac Schneersohn, several times a week. 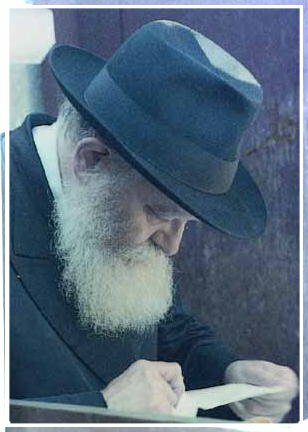 The Rebbe chose to take the thousands of letters he received, containing people's troubles, joys and prayer-requests of all sorts, to the holy resting place where he would stand for hours, painstakingly reading every one. Today, thousands of people from all walks of life and all shades of the spectrum, religious and non - religious, affiliated and non - affiliated, come to the Ohel to pray at all hours of the day and night to receive inspiration, blessing and guidance. Stories abound of miraculous reprieve resulting from a visit to the Ohel. This should come as no surprise as we recognize the Rebbe's life-span as a continuum of spirituality and holiness. While on this earth the Rebbe related to G‑d on higher plains, our Sages tell us that after the Tzaddik leaves his physical constraints this only intensifies. But as during his lifetime, being in the Rebbe's presence has not only a salutary, redemptive effect, but motivates and charges one to continue, indeed to strengthen, one's thought, speech and actions in the realm of goodness and kindness. Many carefully observe the custom of accepting a new good deed, before going to the Ohel; these are the "conduits" through which G‑d's blessings can flow. Many who remember the Rebbe go not only to pray, but to re-experience the moments of spiritual elevation one had in the Rebbe's presence in his lifetime. Click here for Kuntres HaHishtatchus - a Chassidic discourse on the subject of visiting the gravesites of the righteous (by Rabbi DovBer of Lubavitch).